My Mother has been making this very simple two-ingredient appetizer recipe for a long time. Year after year, she impresses people at her annual Christmas party who huddle around her as they come out of the oven because they disappear so quickly! Clean mushrooms. Pat dry and gently pull off stems. Cut rough ends off of the stems & then chop the rest of the stems finely. With a small spoon, gently scoop out centers of mushrooms. In a medium bowl, mix chopped stems and mushroom meat from the centers with the sausage. 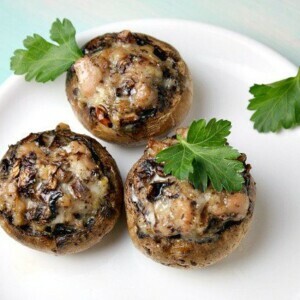 Fill mushrooms with a spoonful of sausage mixture. It's okay to mound up the sausage slightly since it will tend to shrink down when cooked. Arrange in glass baking dish with 3 tablespoons water in the bottom of the dish. Bake, uncovered, at 350 degrees for 45 minutes. 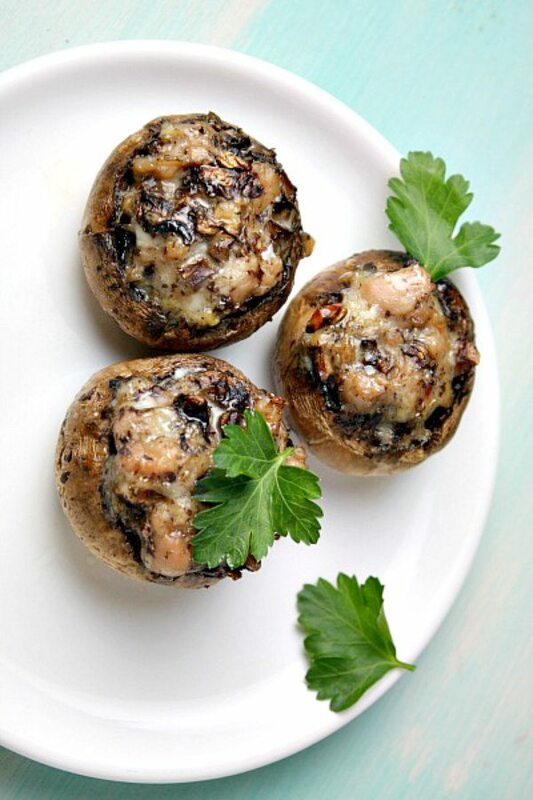 Top each mushroom with a tiny sprig of Italian parsley (if using) and serve immediately. 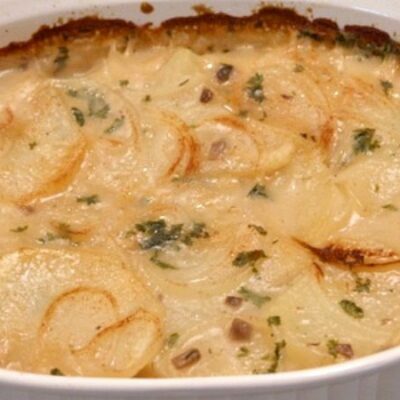 Prepare these ahead of time so that they are ready to pop in the oven. Stuff the mushrooms and then place them in the refrigerator (covered) until ready to bake. You'll then have steaming hot appetizers to pass on a tray and they'll be devoured quickly! A reader recommends: For a different spin on this recipe, brown the sausage, drain and cool. Mix with one package 8-ounces of cream cheese. Fill the mushrooms with the mixture and cook for the same amount of time at the same temp. If you are preparing this recipe as gluten-free, just be sure to use a brand of sausage that is known to be GF. First of all, I use hot jimmy dean. Next I take the steams and cut them up an light fry them in butter first. Next I take the sausage an mix it with an egg an the steams an a drop or bread crumbs also parsley,salt & pepper. I would like to make these for my mother’s 90th B-Day party. Can I possibly use a large aluminum cookie sheet, rather than the glass pan, to bake them? I can fit more on that way. Thank you. What a great idea. Cannot wait to try them. Thank you. I made these last night to go with our ribeye steak. I used Hot sausage and added garlic (because we love it) also added some fresh grated Parm right when they came out of the oven and the parsley on top. Very good. Thank you for the recipe!!! Do I have to cook the sausage before stuffing it in the mushroom? No, it will cook with the mushrooms. I made these last night with our Christmas dinner. My husband (who doesn’t make many comments about meals) said they were the best stuffed mushrooms he has ever eaten. He even asked for them again tonight! I didn’t mind because this is the EASIEST recipe! I’ll be making them again. So funny, we made them too! Glad you enjoyed! 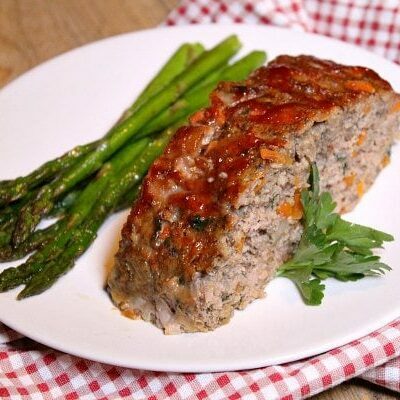 This turned out great – thanks for the recipe!